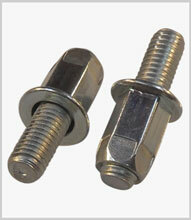 Provide a quickly installed permanent rivet nut type of assembly but with a re-usable male screw thread. Used mainly in sheet material where accessibility or other installation processes, e.g. welding, are not practical options.